Barron's Educational Series: 2016, 15th ed. - 864p. + CD1-2. + CD-ROM. 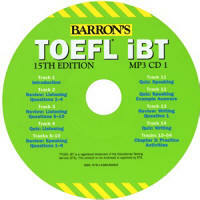 The most up-to-date TOEFL test prep manual on the market, the fifteenth edition of Barron's TOEFL iBT is available in options that include a book with two MP3 CDs and CD ROM. 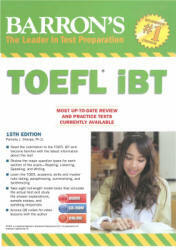 The manual presents: A general overview of the TOEFL Ibt. Seven model TOEFL iBT tests with answer explanations and sample writing and speaking responses. A review of required academic skills, including note taking, paraphrasing, summarizing, and synthesizing. A review of language skills, including listening, speaking, reading, and writing in English. The manual can be purchased with a CD-ROM and two MP3 CDs. The CD-ROM presents iBT versions of the book's 7 TOEFL practice tests plus a bonus TOEFL iBT. .
CD-ROM (2016. 15th.) CD-ROM does not require installation. Диск открывается простым щелчком по значку Приложение. 3. Barron's TOEFL® iBT Superpack consisting of the Barron's TOEFL® iBT book with 2 MP3 CDs and CD-ROM, Barron's Essential Words for the TOEFL, Barron's TOEFL Strategies and Tips with MP3 CD, and Barron's Writing for the TOEFL iBT with MP3 CD.